Two months ago, Political Geography Now published a map of Boko Haram rebel control in Nigeria as the government declared a state of emergency and began a large-scale military intervention. 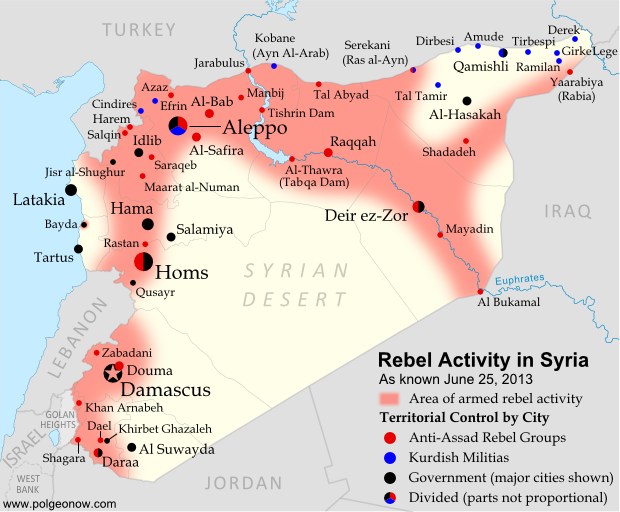 We now present an updated map of the continued fighting and attacks following the rebels' apparent loss of any significant territorial control. 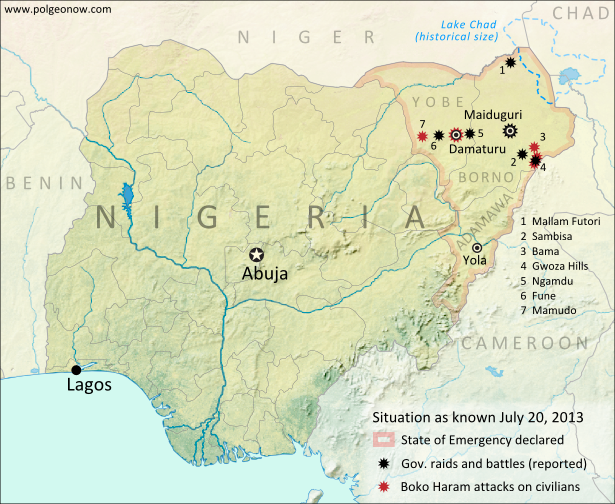 Map of fighting and attacks in Nigeria's war against the rebels of Boko Haram. Map by Evan Centanni. 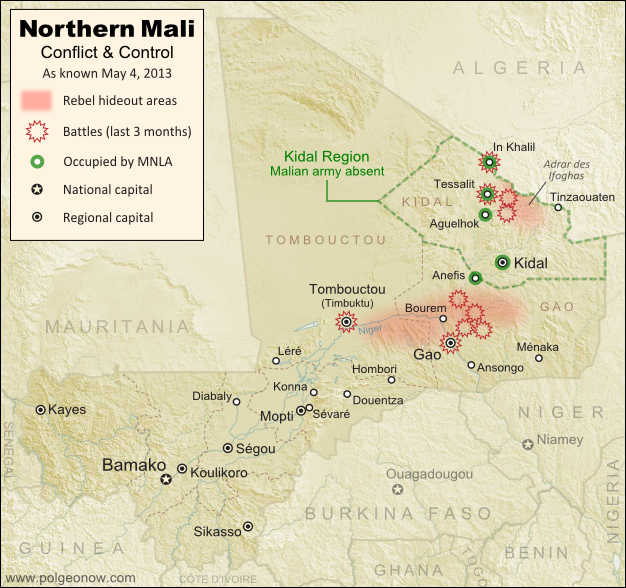 As shown in our first map of the Boko Haram rebellion in Nigeria, a few months ago the rebels reportedly had actual territorial control of several areas of the country's northeast. Details of events related to Nigeria's military crackdown are sometimes fuzzy due to communications blackouts and lack of press access; but according to government reports, Boko Haram's bases have been decimated by the ongoing intervention, and the region has generally fallen back under government control. Boko Haram is a decade-old rebel movement which seeks to banish all Western education and influence in favor of strict Islamic law for Nigeria's north. 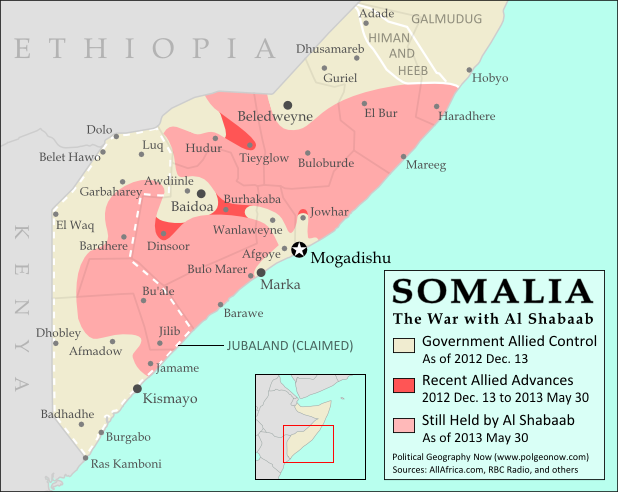 Though the rebels have reportedly been mostly driven from their bases, they have not given up or fled Nigeria entirely. Compared to a few months ago, violence seems to have abated along the former shores of Lake Chad in favor of moving into the region's hills and urban centers. Nigerian government forces have launched raids targeting Boko Haram guerrillas in the Sambisa forest and Gwoza Hills of southeastern Borno State, Mallam Futori near the northern border, and locations such as Ngamdu and Fune in the neighboring state of Yobe. There have also been multiple major battles in the Borno State capital city of Maiduguri. Adamawa, the third Nigerian state in which the state of emergency was declared, has been relatively quiet. Meanwhile, the Boko Haram rebels have been defying the Nigerian army by continuing to launch bloody attacks on civilian targets in Borno and Yobe. Most infamous are two recent massacres at high schools in Mamudo and the Yobe state capital of Damataru, which the rebels say are a necessary part of their struggle against Western education. They have also sacked villages in the Gwoza Hills, as well as the nearby towns of Gwoza and Bama. Nigerian government forces have also been accused of serious human rights abuses. The government of Nigeria claimed last week that a ceasefire deal with Boko Haram was under negotiation, but the head of the rebel group, Abubakar Shekau, later denied this.